Hello! Here we are, at the beginning of November, and it’s been quite a year. I hope yours has been as productive and fulfilling as ours, though maybe not as crazy! We have a lot of new projects and ideas brewing and can’t wait to share them with you. To that end, I’d like to introduce a new guest writer - Jennette Wilson. Though new to the wedding business, Jennette has had her work featured in several publications, and brings a true passion for both beauty and storytelling that we think will fit right in here at Adorations. We’re so excited to welcome her to the team! We passed through the entry of the country club, peering through doorways and down halls in search of our destination. Following the buzz of conversation, we continued until we reached a bright, sunlit space, and I suddenly felt as if I had come into some sort of pocket world. Encased by windows, the room glowed with morning light and energy. There was an air of industry, but also ease; everyone seemed to know their place in this new world, and their purpose, and was glad to fulfill it. LaVonne greeted us with a smile - friendly, cheerful, distracted by her own focus. A well-serving focus made evident in her corner of the staging area, a corner spilling over with the wonderful organized flurry of an artist at work. The request was for greenery growing up along a windowframe, creating a sort of half arbor. Enchantingly, the result looked as if it had been transplanted straight from The Secret Garden. A wilderness of ninebark and huckleberry sprouted from the floorboards as if it belonged, and from this wilderness grew rose vines and pepperberry fronds in an easy, graceful arc. A step away, a tarp lay scattered with clipped stems and blossoms, plucked leaves, and five-gallon buckets overflowing with surplus foliage. Standing back, hands on hips, gesturing, the designers discussed the overall effect. A spray of the pepperberry, apparently as feisty as its name suggested, had taken an awkward detour. LaVonne was soon up the ladder to make the correction. Ultimately, they decided against additional vines. It is easy enough to fidget with a creative project until the end of time, but the arrangement was already well-balanced, and in no real need of adjustment. Later, I learned the blossoms on the rose vines were both unexpected and not quite the prescribed color, but met with a little flexibility and a lot of enthusiasm, became a surprise of great advantage. I watched, fascinated, as the setup progressed to completion. 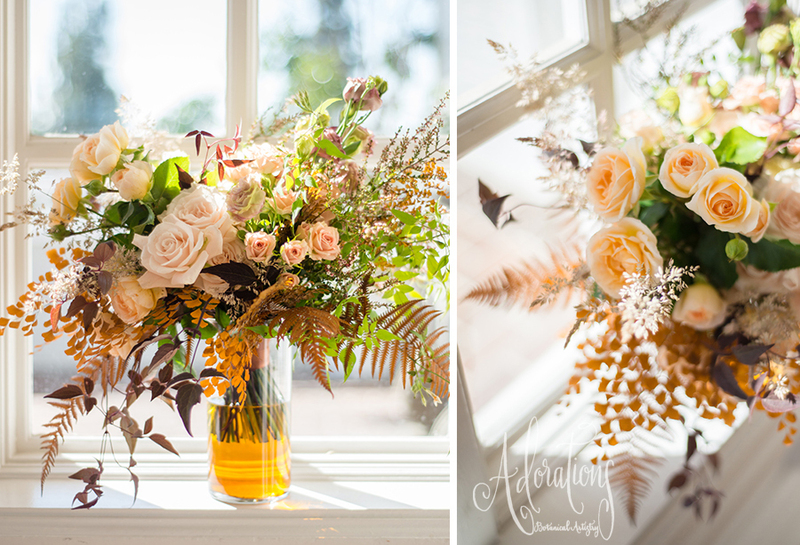 Prop bouquets were photographed, extra flowers gathered and contained, and tools returned to their belts and boxes while the morning sun shone upon it all. We carted the last of the supplies out to the truck and said our goodbyes. The next step was teardown, but that would come later, after the photoshoot, and after coffee. See it in Exquisite Weddings Magazine on newsstands now.